The burgeoning English wine industry could potentially create up to 30,000 new jobs by 2040 according to new figures from Wines of Great Britain (WineGB). There are currently 2,000 people are employed within the UK wine industry, from vineyard workers to winemakers and administrative support to cellar door staff. WineGB states that over the next 20 years the industry will create between 20,000 and 30,000 new jobs, providing a sizeable boost to the economy. It also predicts that by 2040 the industry could generate an additional £658m in revenue a year through tourism as wine estates seek to attract visitors from outside the UK. To prepare for an influx of tourists from the UK and abroad, estates have been upping their game on the hospitality front via vineyard restaurants, tasting rooms and new facilities that cater to winery tours and tastings. The UK wine industry is experiencing rapid growth. 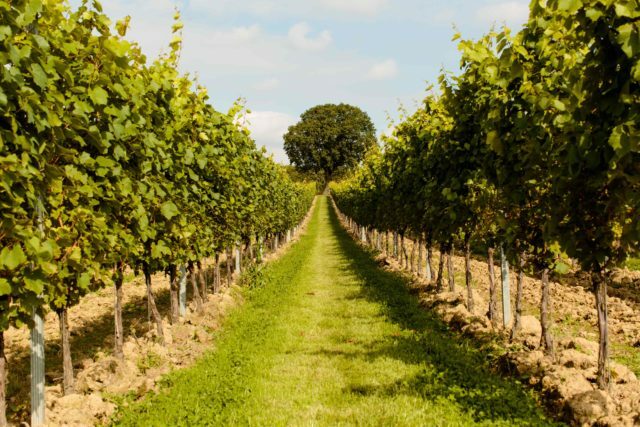 There are now over 500 vineyards and 165 wineries operating in Britain. Last year the industry enjoyed its largest harvest on record – equivalent to £15.6m bottles – an astonishing 130% volume increase on 2017. Sales of English and Welsh wines doubled last year and exports also doubled. English and Welsh wines are now exported to 40 countries and the wines are doing particularly well in the US and Scandinavia, which currently account for 65% of all exports. The area under vine in the UK has increased by 160% in the past 10 years to 7,000 acres. Last year, 1.6 million vines were planted with a further 2 million expected this year. “2018 was a milestone year for the industry. Our figures detail the considerable pace of growth taking place here in the UK and what exciting predictions and opportunities lie in the future,” said Simon Robinson, chairman of WineGB. “As a sector we are bringing many developments in agriculture, tourism, education, investment and employment. This is now a thriving and confident British industry in which we can be justifiably proud. Watch this space!” he added. Chardonnay, Pinot Noir, Pinot Meunier and Bacchus account for 76% of all plantings in Britain. Sparkling wine remains the dominant style, accounting for 71% of the wine produced in the UK. And there is further growth potential on the horizon – WineGB reports that there are approximately 70,000 acres of land in the UK suitable for wine production. At the current rate of growth, the UK could be producing 40m bottles by 2040. Investment in the industry by Champagne houses Taittinger and Pommery in Kent and Hampshire has added gravitas to English wine’s plight to be taken seriously as a producer of some of the finest sparkling wines in the world.